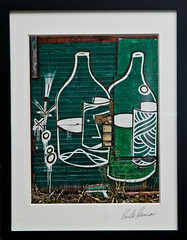 I am donating a framed 10x13 print for an art photo auction fundraiser to support Project Schoolhouse. I chose a photo I took earlier this year of some graffiti in Georgetown. The building it was on was demolished later that day. The money earned from the auction will go to help pay for a photo documentary and materials to build school houses in Nicaragua. Auction will be held at the Skylark Lounge on Sunday, December 14th from 5PM - 7PM. The Raggedy Ann's will also be performing live at 7.